Men who grow beards, mustaches, goatees, or other facial hair styles need to find a way to trim their facial hair quickly. Hair grows fast and it must be trimmed to stay looking good, particularly for work. But sometimes comb and scissors is not enough, and a rotary shaver is out of the question. 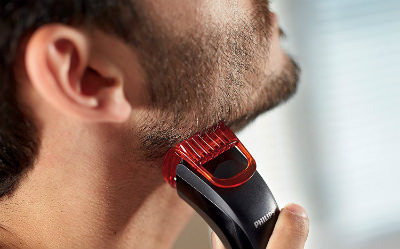 Philips offers men several different choices with their line of beard trimmers. 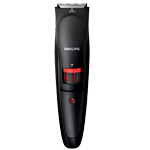 The Philips BT405/13 Series 1000 Beard Trimmer is a narrow long trimmer in black plastic with a slightly elongated easy-grip shape. It also curves inward to make it easier to grip in the hand. It’s cordless and rechargeable, and meant only for dry usage. It looks a lot like a smaller size of men’s shaver. It has a metal comb-like trimmer at the top. The cutter width is 32 millimetres. 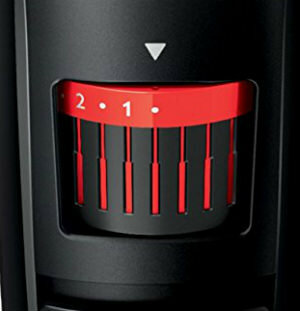 The Philips logo is displayed in white about a third of the way down the front, with a red and black dial to select the length underneath. 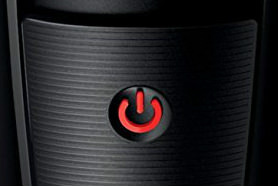 Below that is the red and black circular power on/off button that you push to activate. 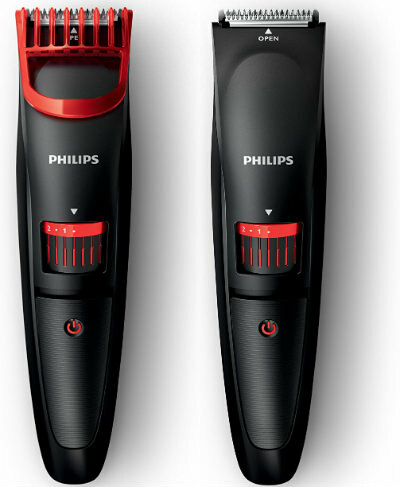 The blades of the Philips BT405/13 Series 1000 Beard Trimmer are designed to be skin-friendly. They have gently rounded tips to prevent skin irritation and to keep the trimmer from ripping or tugging at hairs. You’ll be able to do precision trimming with a full size 32mm trimmer. 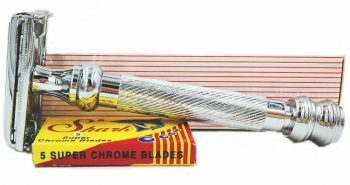 The blades are also self-sharpening, which will always provide for a neat and effective cut. The Philips BT405 groomer has been designed to be simple to use, even when grooming around hard to reach spots on the face or neck. It gives you a simpler way of grooming, rather than attempting to do it with your electric shaver or a comb and scissors. The trimmer will glide over the curves of your cheekbones or your jawline. You can even use it to tidy up your eyebrows. There is a clear red plastic comb attachment to extend the length setting choices. This comb also protects skin from nicks and cuts. It snaps on and off the head of the trimmer. There are twenty different lock-in length settings. You can choose from 0.5mm to 10 mm. 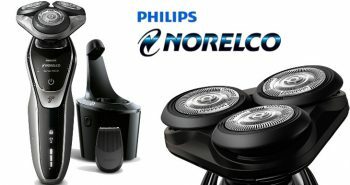 To choose, you simple spin your trimmer wheel, and then lock in the precise length that you want. The 0.5mm choice will give you a three day stubble look, while if you trim to the 10mm choice, that will still give you a full bearded look. This trimmer is only designed for dry usage, but the head does pop off, so it can be washed under the tap. Ensure it is fully dry before popping back into position. The red comb can easily be washed and dried for easy maintenance. There is only one comb in this set. The Philips BT405/13 Series 1000 has been designed with an ergonomic handle. This eases the fatigue even when you have to trim your entire beard, or simply like to take your time while doing so. It also makes it simpler to trim hard-to-reach areas. 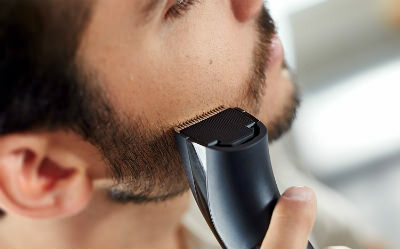 It takes ten hours to fully charge up the trimmer which will give you thirty-five minutes of shaving time. When your trimmer is charging up, there is a light on the adaptor that will show green when it is charging. 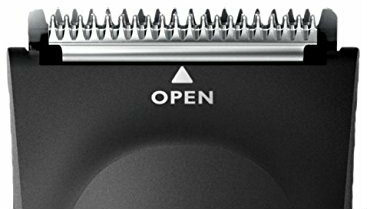 The Philips BT405 beard trimmer is priced at around $60, making it an affordable purchase for men with beards. 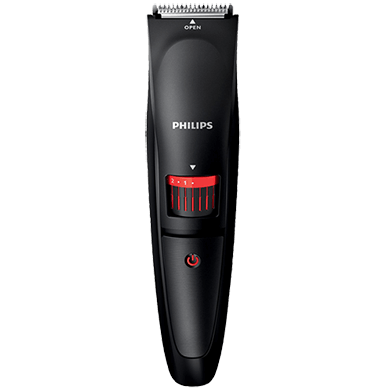 In the box you’ll get one Philips BT405/13 Series 1000 Beard Trimmer, one red beard trimmer comb, a cleaning brush, a charging cord, and a user manual. There is also a two year warranty. The box weighs 3.5 ounces, while the trimmer weighs 2 ounces. The trimmer does not need any oil to keep functioning well. You can purchase a Philips shaving head cleaning spray if you wish to have an easier way of cleaning it out then rinsing it under the sink. The aerosol spray will force out any hairs caught inside. The trimmer has a worldwide voltage compatibility so you can take it with you on your overseas trips. Don’t forget that you still need a converter plug so it fits with the outlets at your destination. 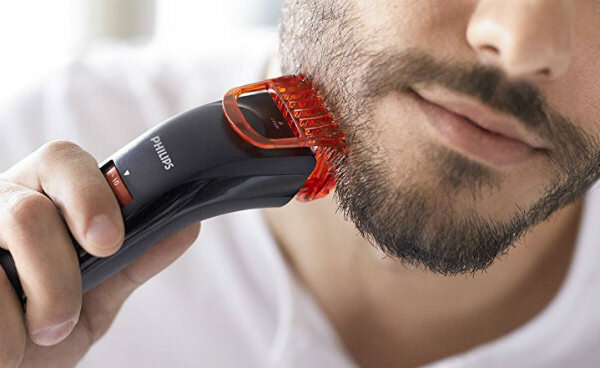 On the Philips site this beard trimmer earns 4.5 out of 5 stars. 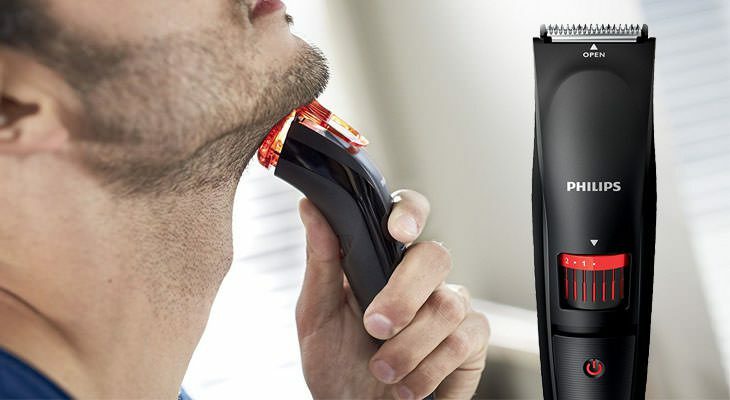 Most men who try this trimmer rank it high in performance, ease of use, and design. 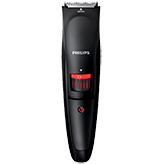 If you’re searching for a quality men’s beard trimmer, Philips makes the Philips BT405/13 Series 1000 Beard Trimmer which has some great features. The black and red colour will be attractive to younger men who have found their ideal facial hair style. If you’re not concerned that it’s only a dry trimmer, and only has one trimming comb, then your search stops here. Nick Davis is a lead Product tester at ShaverGuru. His passion for helping people flows through in the expert reviews he provides. Previously he has been in consumer products industry for 10+ years.